I think I may be addicted to this stitch that goes by many names. I'm going to call it the half double crochet rib stitch. I first fell in love with it a couple of years ago. I came across a ravelry hat pattern called the surface braid hat. The name surface braid hat fit it perfectly. 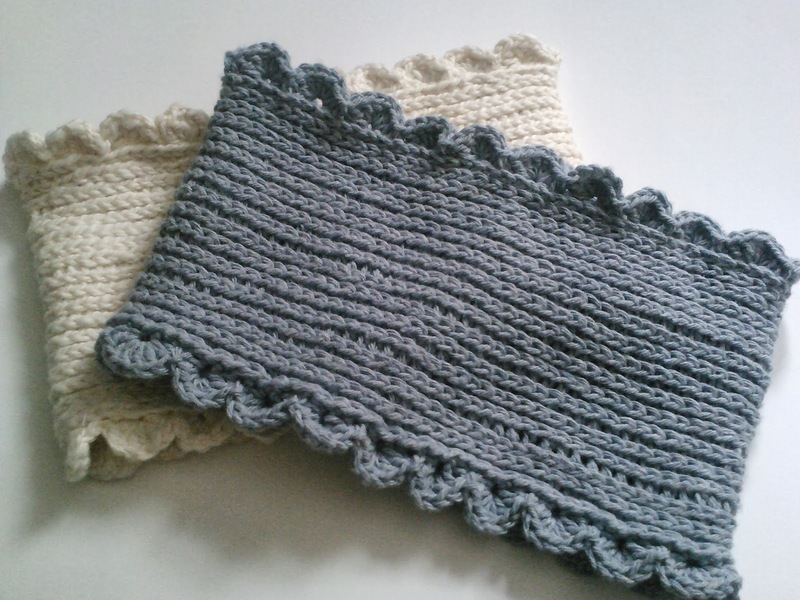 It made me remember my early childhood fascination with the knitted stockinette stitch. Such knitted pieces fascinated me because they were just like the "cornrow" hairstyles I used to beg my mom for and sit for hours to have my hair styled into. I would wonder how the stitch was made and used to hope to someday be able to produce it myself. I never made a surface braid hat; but, have since made many other items using this stitch. 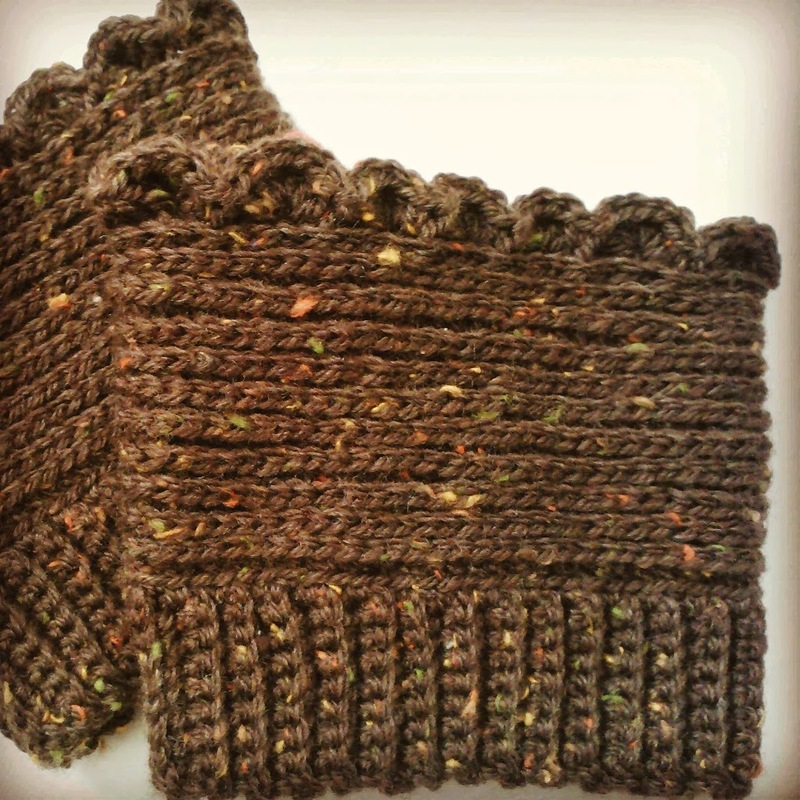 My latest crop includes the extra toppings please boot cuffs and my cottony cowl. I also have something else growing, due to sprout this spring. So if you haven't already given it a try, I think you should add it to your stockpile, I think you'll grow to love it for its versatility, flexibilty and ease to produce. 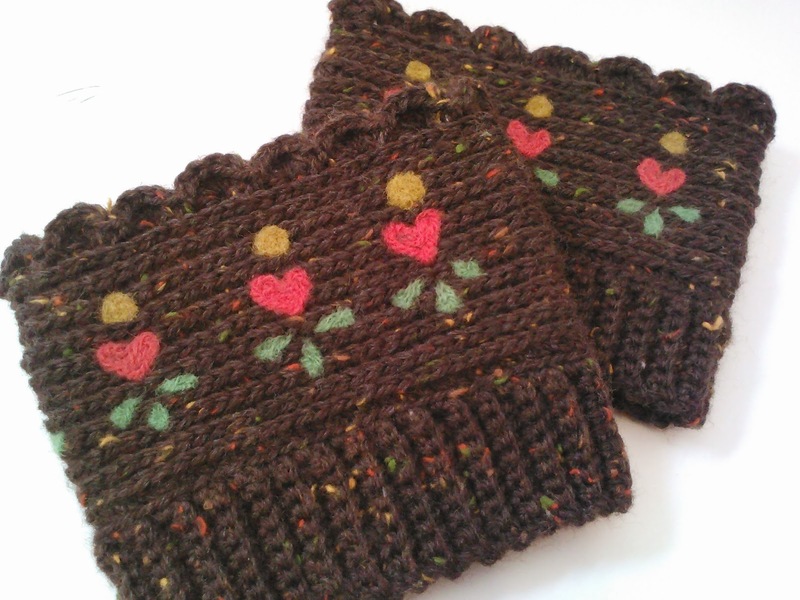 So, I've been thinking about boot cuffs with a little flair for a while. I was thinking flowers, leaves...something for added texture and color. So when a friend recently requested a couple of pairs with flowers, I wasn't too nervous; but, a little nervous because special requests can sometimes be limiting. This time the limitation wasn't the design itself but the size of of the design. I had to consider a couple of things. One, the bottom half of the cuff would be totally hidden. Also, the middle might be partially hidden; so, the embellishments couldn't be too bulky nor too large. I came up with a design for a cuff that I think came out great for adding extras. 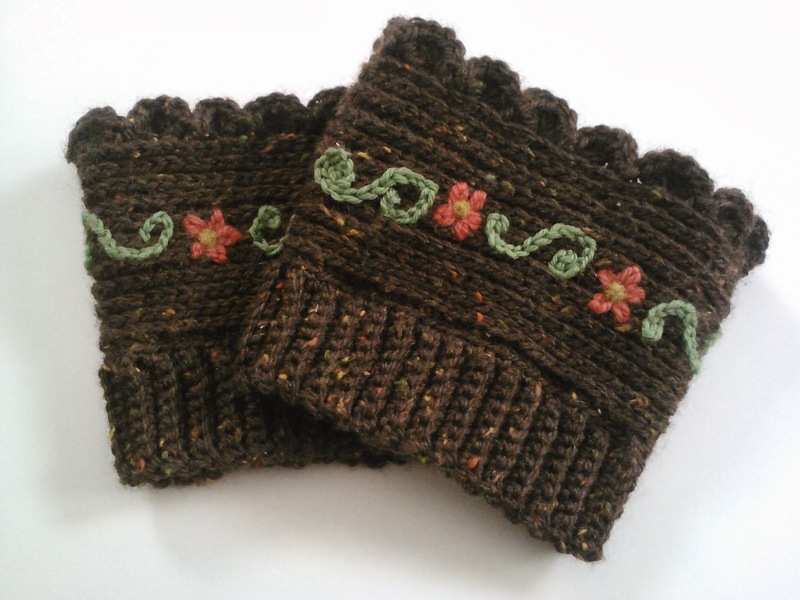 The design is also great because the stitches used make the cuffs good for fitting a wide range of sizes. Since the color requested was brown tweed, I used Patons Classic Wool in this dark brown dabbled with orange, green and yellow. This color combo immediately said folksy; so, I thought flowers and hearts with some leaves. the next decision was how to add the designs to the cuffs. 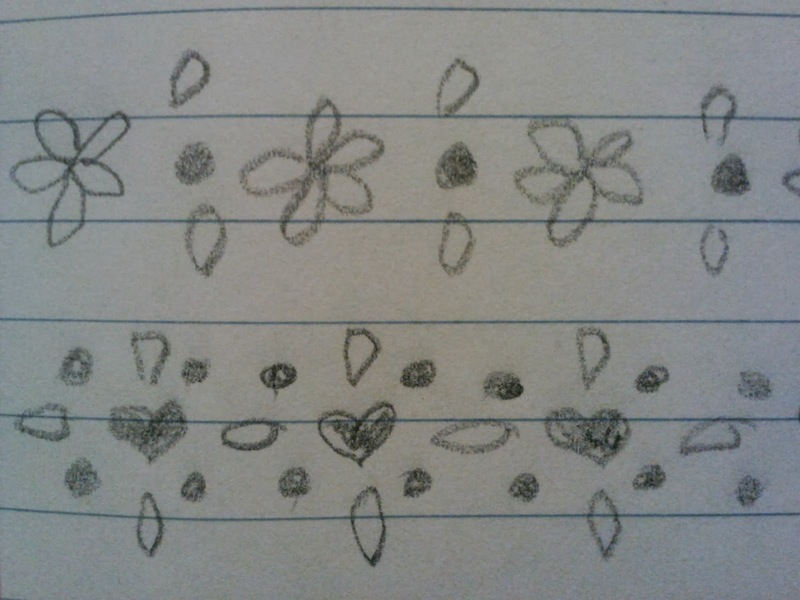 I decided embroidery would work for the flower design. The final design ended up different than my drawing but I like it. I like adding embroidery to crochet. I like that little something extra it adds and it encourages me to become better at embroidering and to learn more stitches. The heart design had me stumped some. Crocheted applique' would be too bulky and I have yet to successfully embroider hearts. After some thinking, I decided on a needle felted design. I remembered being inspired by a great tutorial by Mrs. Polly Rogers when I was working on a crochet project I wanted to add a heart design to as well. The needle felting was the perfect solution then and now. I like adding needle felting elements to crocheted and knitted pieces because it is so flexible. Its scale can easily be adjusted to fit projects made of various stitches and projects made in different sizes. I'm pleased with how the cuffs turned out and wanted to share the pattern, should you have an urge to top a pair toppers yourself.